Many people starting with WordPress don’t know their options if they ever get stuck with anything. Most start digging for the answers themselves, which is natural. But this approach might take some time and won’t guarantee finding a fix. Some will turn to their friends for help, but this might also not work if the issue proves too complicated. Ideally, there should be some reliable help at hand anytime, right? Well, there is. And it’s both reasonably priced and quick to manage – meet Fiverr for WordPress – probably the best place to go if you need some WordPress help. 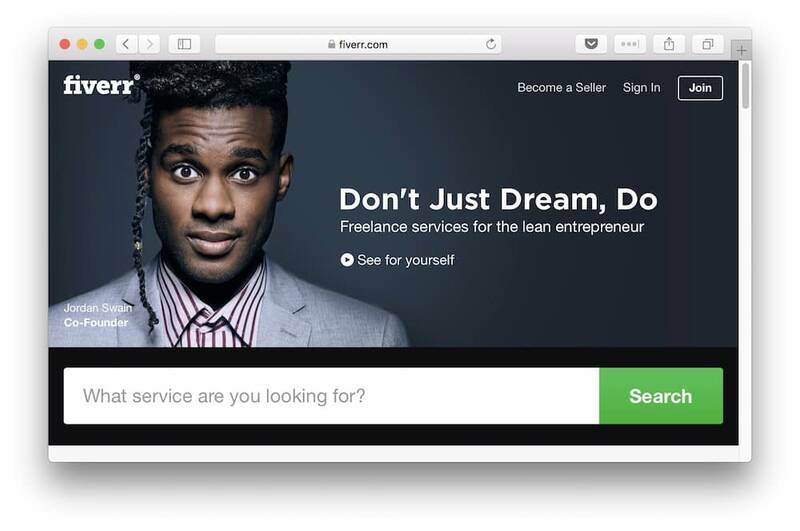 In short, Fiverr is a freelance marketplace where people offer their skills and services (called gigs) for as low as $5. Albeit the platform has evolved and shifted to include more complex services and higher priced gigs as well, the good cheap stuff is still there. And those cheap gigs are enough to cater to your basic WordPress needs – WordPress bug fixing and debugging, customization, CSS & HTML tweaks. 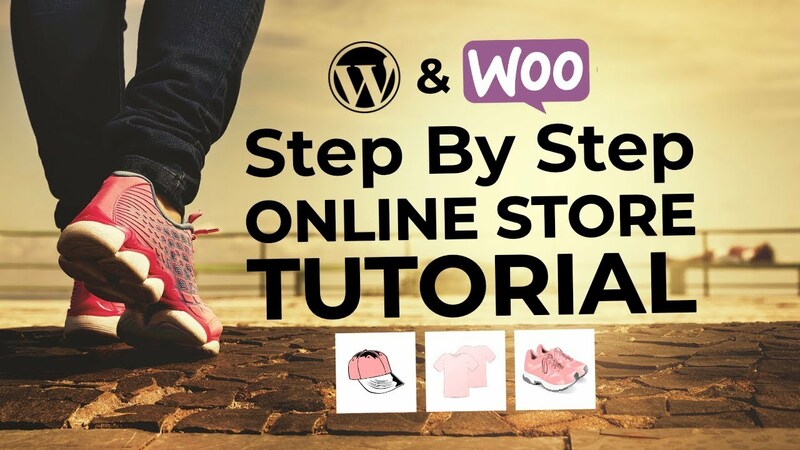 In this post, I’m going to guide you through solving a WordPress issue on Fiverr while documenting the process step-by-step. This will be a hands-on tutorial and a real job will get done with the help of Fiverr. So let’s get started! How to use @fiverr for #WordPress tasks? First things first: you’ll need to set up a new account. If you don’t have one already, that is. Just head over to Fiverr.com and click Join. You will be asked for an email address, a username, and a password. It doesn’t have to be your real name, but after you’ve confirmed your account, you will need to provide accurate details for online payments. 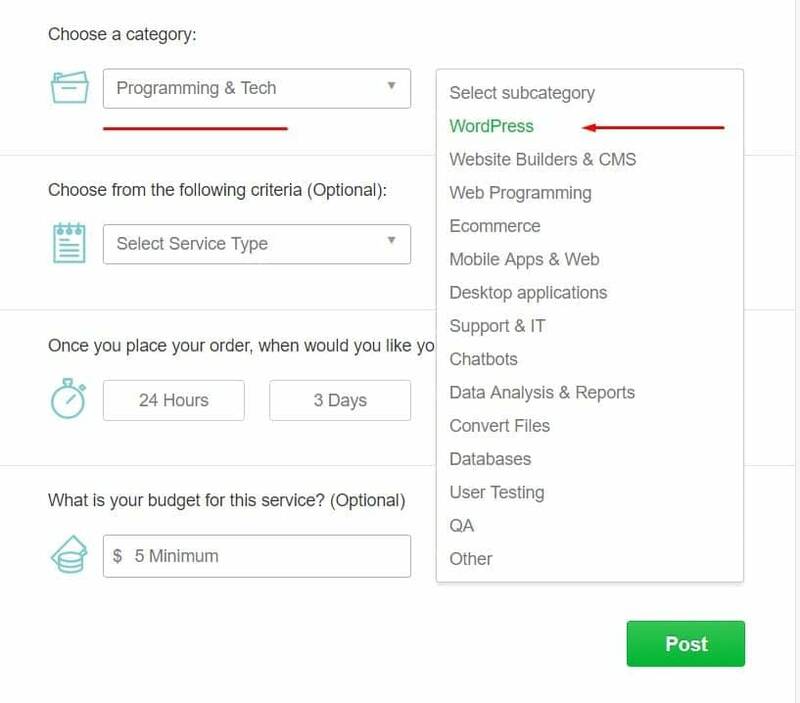 Next, I’m going to pick a common WordPress customization request to work with, but anything from this list of Fiverr WordPress customizations would work just the same. There are several ways of reaching out and getting help from Fiverr sellers. I will mention all three of them, with pros and cons, and then will detail the one that I find the most effective. You can, theoretically, find the best value-for-money gig out there. Searching through gigs might take longer than planned. You might find yourself looking for a simple gig for hours. There are thousands of sellers offering the same services, so sorting through them is a bit challenging. Allows to pitch a project to a specific seller that you want to work with. This method usually applies for repeated projects with a preferred seller. The sellers might request an additional payment to your initial order, so the overall price could get higher. 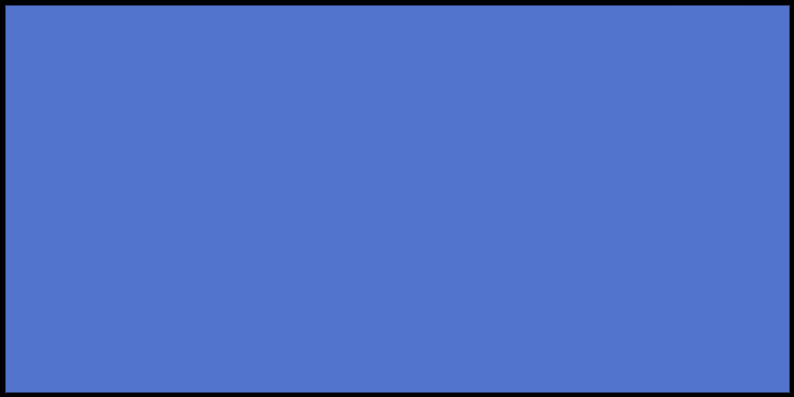 This method allows you to compare between several offers/prices you receive. There will be some additional time needed to go through some of the spam offers that some sellers will throw at you. 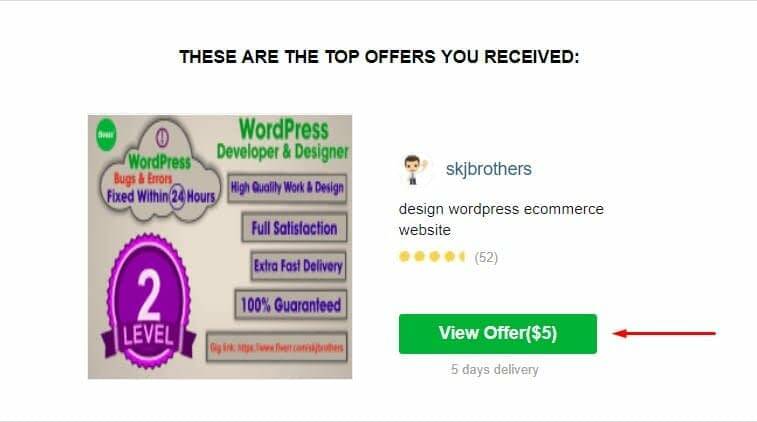 If you are new to Fiverr and you don’t have any preferred sellers, my suggestion is to go with that last method of approaching Fiverr for WordPress. Next, I will show you how that works. To make a custom request, you will need to fill up a simple, straightforward form that gathers all the needed details to help sellers better estimate your project. Hey there, the Blog section on my website’s homepage currently features two posts. You can see how they are displayed in the “Read our blog” section. I’d like you to add a carousel for this section that displays 3 posts at a time and that gives the possibility to see the next/previous ones by clicking on left/right arrows. To make sure that you’ve read my request please include the keyword “kite” in your reply. Let me know if you have any questions! 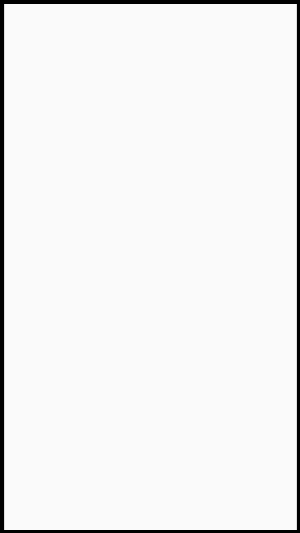 The budget is optional, and my advice is to leave it blank. You’ll be able to better compare the offers you receive. For almost all orders I’ve placed, there were people willing to complete them for $5 as well as for $100. So you’ll too probably see people who just want to overcharge while there will be others able to do the gig for less. After posting the request, it first needs to get approval from Fiverr. It takes around 5-10 hours until the request gets approved. In under 24 hours, my request got 36 replies. I was away and didn’t check my email, otherwise I would have paused it sooner. Before jumping in to review the offers, make sure you Pause the request. Otherwise you will keep getting new ones that you’ll need to catch up to and the circle will never end. You will also receive an email notification from Fiverr with the top offers you received. However, after checking them out, I decided to skip them. One of the two offers that came via email – initially quoted at $5 – had increased to $40 when I checked it on the site. So be extra careful before hitting the “Order now” button. Apparently, some sellers are trying to game the system. The other “Top” offer selected by Fiverr didn’t mention the secret word. My conclusion, in this case, is that you can’t really trust the Fiverr algorithm much. This doesn’t mean that the sellers would fail if I had ordered from them, it’s just that I prefer to go the safe way. Moving on, let’s go through the received offers and see what we’ve got. There are others that replied spot on, but didn’t quite get the secret word conspiracy, which makes me doubt they will carefully read and understand any further instructions. Delivery time – even if you’ve asked for 24 hours, the actual delivery may vary from offer to offer. Make sure to check the exact delivery time provided. Number of revisions – Some sellers don’t have this specified, though it’s unlikely they will ask for the payment if you’re not happy with the results. The risk of getting a bad rating from you will keep most sellers flexible about revisions. Read through the seller’s gigs and see what type of services they’re offering. This will give you an understanding of their overall skills. Reviews – make sure you read through them. If you just find “Excellent service” in the description, it’s not telling you much and might even be a fake review done by another user. Recent delivery time and the date they’ve joined Fiverr are less relevant, as many sellers who apply for buyers’ requests are beginners. Those new sellers will be labeled “New arrival”. But this doesn’t mean they are beginners to WordPress or to freelancing. Before placing any order, my advice is to always follow up with a message to the seller. This helps check if they fully understood the request. By checking the way they reply you’ll also get to see what their level of involvement is. Use this step to make sure you have communicated all of your job’s requirements. Hey, thanks for signing up for my request! Do you have an example of how the carousel will look like? Can you please confirm that the carousel will be responsive and created with a child theme? TIP: Include a visual example of what you want to achieve. Wording can be tricky sometimes and your message might not get through. Most people on Fiverr speak English as a second language, so there might be some difficulties in getting the message across. Contacting the seller before placing an order is always the best practice. First thing to do after you’ve decided for a certain gig is to check in with the seller and see if they’re up for the job. Some sellers make this a requirement and place this at the top of their service description. I chose the seller who asked the right questions and made the most sense. He was also one of the cheap ones – asking for $10 total. The most expensive offer I got was $100, while the cheapest was $5, which didn’t use the secret word. However, as it turned out, this seller was not exactly capable of getting the job done the way I needed him to. He added a carousel showing all eight posts at once (instead of just three – which was what I wanted) and messed up the design. After several rounds of conversation, I figured that we’re not getting anywhere, so I closed the deal and paid for the service. I believe things would have turned fine in the end, but it made no sense to waste more time. I moved on to discuss with another seller, and he asked if he could work without me placing an order on Fiverr. He downloaded the theme and started working. I immediately trusted him, plus the fact that he was a Level 1 seller helped. He must know what he’s doing – I said to myself. He showed me a couple of examples and clarified everything before getting to work. When everything was done and I was happy with the result, he asked me to place the order, which was just for cashing in on the already delivered job. This is just a smart way for sellers to keep their rankings up. To place your order, go back to the list of offers Buying → Manage requests → Paused → Review offers, find your seller of choice and select Order now. This will take you to the payments page where you can select to pay by credit/debit card or PayPal. The checkout will also include the Fiverr processing fee which is $1 on purchases up to $20 and 5% on purchases above $20. Everything is pretty straightforward here. After you have made the order, the clock starts ticking. Fiverr offers all the tools needed to complete the project – a space for discussion between buyer and seller, it supports file transfer and takes care of payments. Finally, when the seller delivers the order, you will be able to ask for revisions. If everything looks good, accept and review the order. There is no way to escape the reviewing step. Fiverr relies on the reviews system, so it will ping you until you have submitted both a private and a public review for the seller. In the last step, you’ll be able to reward the seller with an optional extra tip. It is always a nice gesture to offer someone who you feel has done a good job an extra $5, especially if you think you’ll be working together in the future. To be able to track the progress and offer quick feedback to the seller, I recommend installing the Fiverr mobile app. 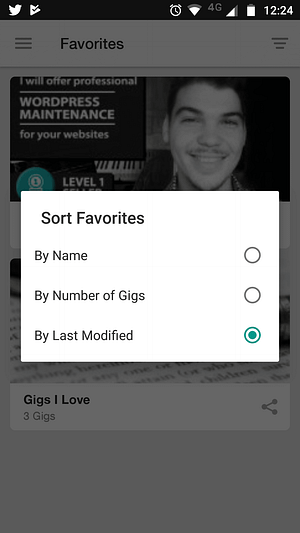 Another way to use it when browsing for gigs is to save the most interesting ones in Favorites for later, just like you do on Pinterest. And that’s it! This has been my guide on using Fiverr for WordPress. 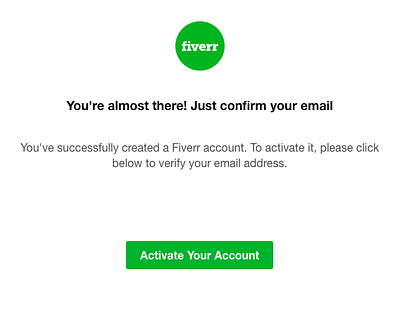 Fiverr is worth giving a try, even though things may not always run smoothly. In the grand scheme of things, however, you will come across someone that’s good and able to complete your tasks reliably. And the more you work with that person on a regular basis, the better the results are going to be. 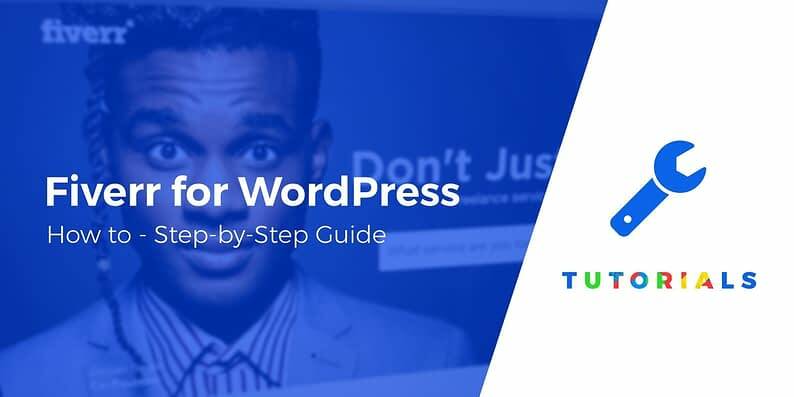 Have you tried Fiverr for WordPress tasks before? Let us know in the comments how it played out for you!